I made a small research after a comment in last article. For Xiaguan, they registered the 'Pine & Crane' label in 1992, but it was in 1996 that Zhong Cha label was swapped for the 'Pine & Crane' label. The tuocha was the first to adopt the new logo, the iron cake changed the logo at a much later date, in early 2004..
Also, Scott mentions in his 2004 Xiaguan Iron Cake description, that it's Xiaguan tea factory's first tea cake to bear the "Crane" Brand emblem. I got this tea from Scotts Yunnan Sourcing LLC more than a year and a half ago. I like the shape of iron cakes so I decided to try this tea. Unfortunately, I was able to purchase only the last piece. As I wrote, I really like the sharp edges of iron cakes, so that’s why most of the photos here is of the beeng itself. The beeng is Te Ji or best quality grade, but without silver tips. It should have a box – I got it without it and so the cake was broken into two pieces. 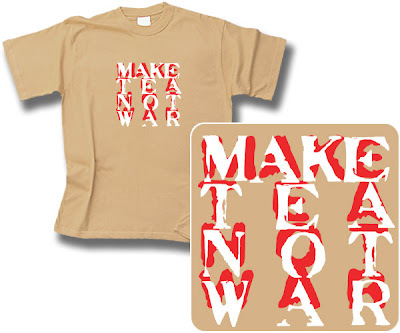 But hey – I have to break it to drink the tea, so it does not matter too much. Compression. Well, the Xiaguan is famous for it's compression making granite-hard puerh. And iron cakes are made by hudraulic compression, so I was expected it to be really petrous piece. But when I unpacked the wrapper, I was surprised, how ethereal is this cake. Light and airy, it’s possible to break it by bare hands. The leaves are small and cute, the cake itself emits very strong and healthy aroma, woody with touch of flowers. Even if this beeng is nearly five years old, it’s still pretty young. Unfortunately, since I like it and drink it a lot, I will probably not see it to mature and age. On neifei is clearly printed the year when the cake was produced – it’s good for collectors, although I know that faking the neifei is nearly effortless. 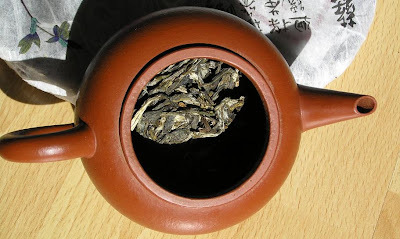 I prepared the tea in my sheng pu-erh zhuni teapot, using about 6 grams of leaves in 150 ml water. As always, I started with very short steeping and I gradually prolonged them. The liquor is light orange, thick and aromatic. The taste is full bodied, but delicate and nimble. It was surprisingly sweet with honey and hint of fruits, resembling dried plums. In those five years the tea lost it’s harshness but still doesn’t developed the aged taste. No smokiness at all, it’s very enjoyable tea right now. Should I buy this tea again, if it’s available? Certainly! The iron cake form isn’t just very cool, but the tea is tasty, very enjoyable and has a potential to improve. The Haiwan tea factory was founded in 1999, so this beeng was produced by relatively new tea factory. This may be good, because the workers and owners may be still enthusiastic - good example is the 2005 year for San Ho Tang tea factory. And this may be bad, if the workers aren't skilled enough. Producing good pu-erh is more art than just labour. I got few of these beengs from Scott at Yunnan Sourcing LLC. They were relatively cheap and nowadays 7 years old pu-erh is “the aged” tea. I never tried them before by myself, because of some not-so-good reviews of these beengs. Unfortunately, I read those reviews only after the purchase. But since yesterday I moved some of my pu-erh stash to basement, I decided to try two of those beengs. The first one is the 2000 Haiwan Gu Hua (Fall Harvest) beengs. The leaves were small and dark brown with very few stems. So I threw them into teapot and prepared the tea. The brew had ok color, dark orange, not very clear but neither too muddy. What warned me immediately was the smell of tea. 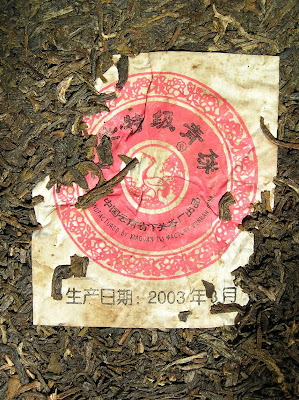 I like the cellar-like smell of aged pu-erh, but this beeng had very aggressive and wet smell. It was like wet stucco. Very wet stucco. It immediately warned me of bad tea. The smell was ok – sweet with touch of honey. But the taste was something I did not like at all – it was very sour, very mineral, and unpleasant. I stopped drinking the tea after second infusion. I’m not sure what caused those problems – maybe very bad storage conditions. Well, it’s moved now into basement and I will let it sit here and rest and, maybe, age. I do not believe that this tea will ever be good, but maybe it will at least age into something OK.
See also: Phyllshengs review, Steven Dodd's review, Hobbes review. Please nottice, that some of those reviews are based on tea from Jing Teashop. Today I made some changes in my pu-erh storage. While holding the different beengs I was puzzled how different are their sizes. So I decided to compare them, from the smallest to largest. Here is the photo (as always, click to enlarge). 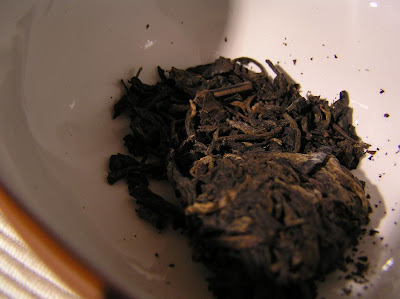 After trying the mao cha, today I drunk pu-erh made of that mao cha. Leaves collected from Big Snow Mountain (Da Xue Shan) at Gu Hua (fall harvest) last year are stone molded into big 1 pound beengs. As I wrote in this post, the cake itself is nearly a piece of art, big beautiful leaves gently compacted in the form of rather big disc. Yes, the beeng is clearly bigger than an average 357g pu-erh cake. This tea is still very, very young. Most dominant is the vegetal, flowery, grassy smell and taste, but I’m sure this taste will diminish as time pass by. No smokiness at all. I can feel how delicate was the processing of beengs, leaving most of bioactivity intact. So there is a good chance that this tea will age pretty fast. This tea lasts pretty long, I pushed 9 infusions from it and even then I stopped just because I was too tired to continue. In later infusions the grassy taste back up, but it was still the most dominant. Touch of fruits and mushrooms stepped forward in last infusions. Actually, I dislike mushrooms very, very much, but fortunately they weren’t dominant. Orange liquor is clear as a piece of crystal, no muddiness at all. Sign of a good kill-green process. Leaves are strong with veins popping with health. Some are quite hairy. Since the taste of the cake is quite specific and the price is quite steep, it’s advisable to purchase a sample and try before buying the whole cake. Today I wake up pretty early to watch Formula 1. The Australian race proved to be very exciting, only third of the cards was able to complete it. Fortunately, the weather is sunny, so I took few pictures from my window. 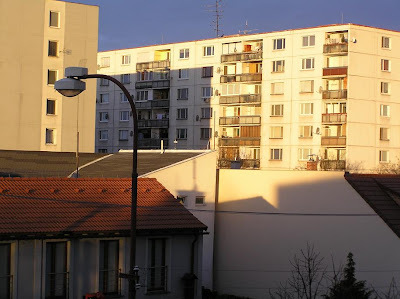 I like the contrast of centuries old catholic church I see to my left and the socialistic blocks of flat which were built in the seventies to my right. Well, the builders had to complete thousands of cheap lodgings, so they did what they could, in the lazy socialistic style. 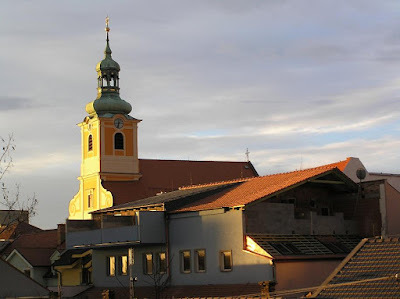 Most Slovaks live in houses like that. I live in house like that. 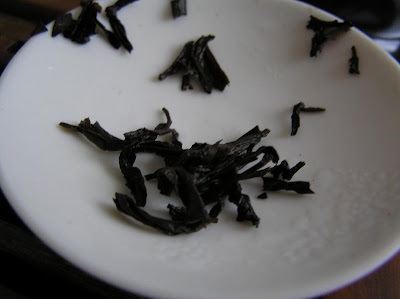 Houses too dry to age pu-erh properly. Well, I will see what they will do with my pu-erh stash in next decades. The dry leaves are small, of uniform dark color. Since they smelled pretty aged, I decided not to use my yixing teapot dedicated to fragrant Dan Cong oolongs and I prepared the tea in thick-walled yixing instead. Also, I used nearly boiling water, not 90C (195F) as I would use with fresh Dan Congs. 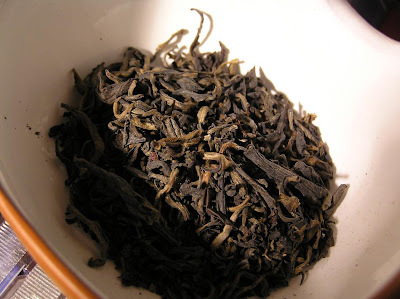 The brew came out dark showing the age of tea leaves. 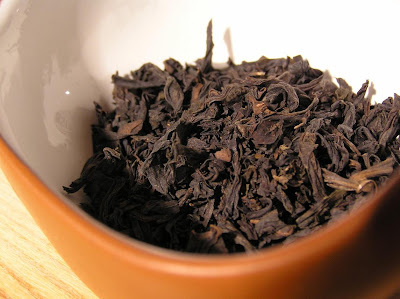 The color was like of aged sheng pu-erh with smell and taste close to it, too. Leaves are small, much smaller, than the current premium-quality Dan Congs. They are uniformly dark. This tea is much more aged then Dan Cong. The flower, honey, orchid fragrances are long gone leaving wood, bark and cellar taste. Still, it’s an interesting tea with OK price tag that lasts enough infusions. 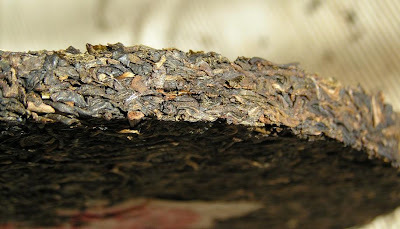 Maybe not as complex as aged pu-erh could be, nor as fragrant as young Dan Cong is, the nice and round with lingering aftertaste make this tea worth at least to try. I drink tea daily, both at home and in office. Certainly, in office I do not have either the time and comfort of gong fu nor the certainly needed good quality water and tea equipment. And I refuse to drink bottled water, because of the pollution caused by plastic bottles. But I also like good quality tea. What is the solution? The selection of tea. 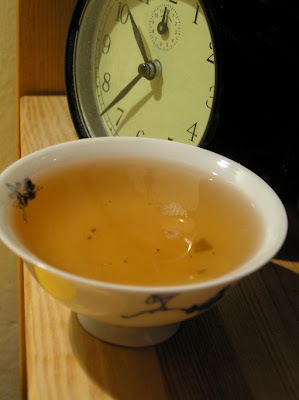 At home I drink mostly oolongs and sheng pu-erh, teas, that require attention and time. At office I drink mostly various black teas and green teas. Certainly, those aren’t the highest grades available, but still it’s mostly very decent stuff. 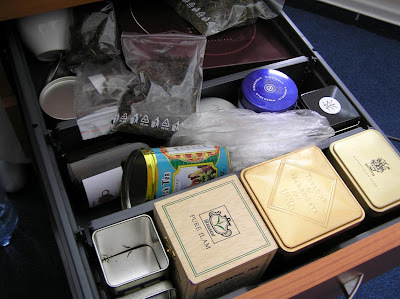 This is my “tea-drawer”. At this moment it contains some darjeelings, both first and second flush, some keemun (I have it for 4-5 years now, so it’s aged by now), some other black teas, few fresh green teas and also some oolongs that go stale but I do not want to throw it away. 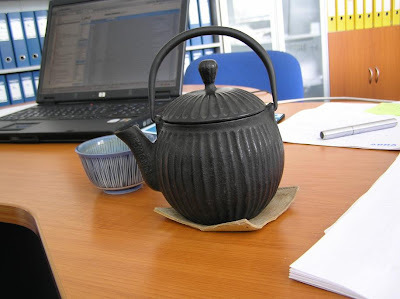 My black tetsubin (cast iron teapot) I use with black teas. I also have one more flat red Japanese tetsubin to use with green teas and one small yixing teapot, when I drink sheng pu-erh at work. Preparing tea in tetsubin is perfect for office, because I do not have to bother with water spilled out, I can use leaf-tea. Also, I mostly use less tea leaves I infuse longer, so I do not bother with more infusions. My japanese office teacup. The size is just perfect and I like the colors and patterns. One big problem with this teacup is, that it’s blue – I can’t see the true color of the tea. 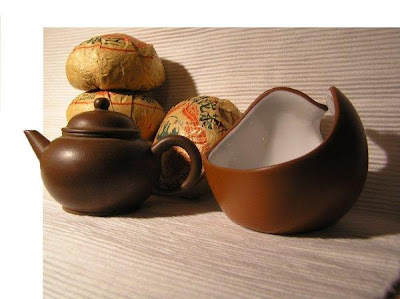 And the photo of complete set of tea accesories. The black tetsubin is missing, it's with tea on the table. And I especially love high quality teas. They are mostly much better than those of the low grade. And still, one gong fu session of very high grade tea can cost less than a bottle of so-so wine. 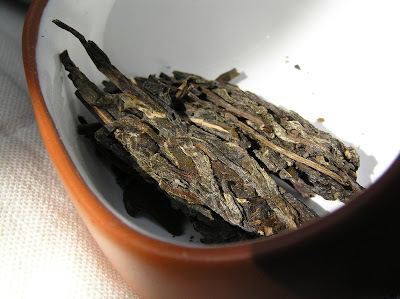 This evening I had very high grade of Rou Gui I obtained from Guang. 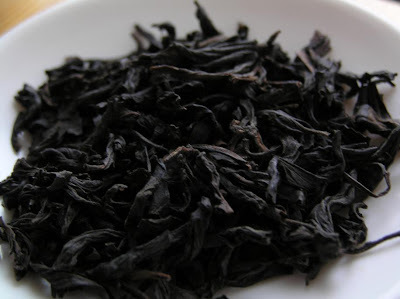 This is a highest grade of spring Rou Gui, literally Cinnamon, from famous wu yi oolong producer, who was elected as one of the twelve "Wuyi Yen Cha Da Hong Pao Heritage Inheritors" in 2006. This tea claims to be entirely hand processed, from beginning to end. The handcrafted teas tend to be stronger, more aromatic then the machine processed. While the modern way of processing emphasizes the fruity side of Rou Gui leaving lots of the leaves greenish this tea was processed in more traditional way. Small dry leaves are uniformly dark giving nice roasted aroma. The first infusion smelled of old wood, fire, spices and malt. While the tea was clearly roasted it wasn’t too robust, the aroma was strong but elegant. Big minus for some oolong is, that they smell much better than they taste. Not this one – the taste followed the aroma leaving long, round aftertaste in mouth and throat. In later infusions the taste become even sweeter, the roasted bouquet was slowly cloaked by aroma of ripe fruits. Especially the aftertaste become better than most of the candy you can buy. The tea lasted in way I like it for some 6-7 infusions – it was a short but intensive experience. On the other hand, I used less leaves, so I can enjoy this very special tea for longer. 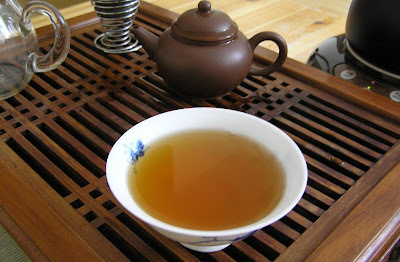 Today’s tea is one of the non-limited autumn productions of San Ho Tang factory, the Nu Er (Daughter) Cha. 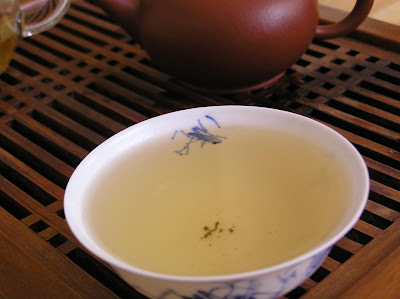 As Guang wrote, this tea was made of sun-dried mao cha from remote old plantations in Jing Gu blended with also Jing Gu’s unique Da Bai Cha (big white tea). 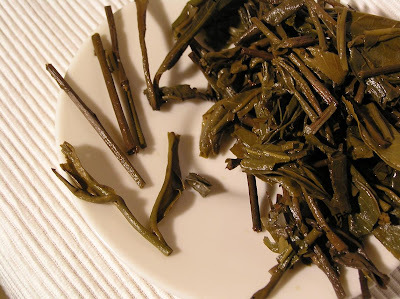 Mr. Chen stressed the Da Bai Cha there was a naturally occurred cultivar in mountains, not like usually on the market they use silvery tips pf Yun Kang #10 cultivar and claim the same thing. Dry leaves are big; the sample looks stone-molded, like all of the autumn production. Since I had 10 grams of sample left, I decided to use them all with my rather big zhu-ni pot. So it was nice that I was able to loosen the sample and get the big chunk of tea into teapot without breaking the leaves too much. Later I discovered, that most of the leaves were broken, but I’m ready to accuse for that the fact, that they originated from sample. The infusions were very clear, light yellow. 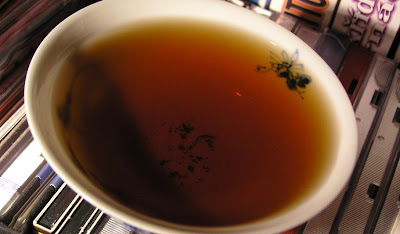 I found traces of smoke in the smell of tea; fortunately, the brew itself does not taste too smoky. It lasted lots of infusions; the taste was the entire time solid and strong. It reminded me of 2007 "5th International Aged Pu-erh Appreciation" Memorial cake in some moments. The Nu Er Cha looks like it was blended for spirit, not the beauty. 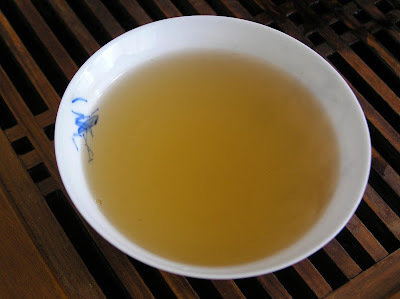 What was absolutely missing from the brew was the floral taste I found in Da Xue Shan, a bit less in Pu Zheng Cha and in traces in 2006 Xi Zhi Hao Nan Nuo. This is old-school pu-erh, yeah. What really disappointed me was the inconsistency of leaves. They were from yellowish through dark green up to brown. Looks like some of them remained in the basket for a bit too long. Also, some of them had unhealthy looking black spots. Conclusion – this tea isn’t bad, but I like the limited productions much more. And since the difference in cost isn’t huge, I believe they are far better choice. But it could be nice to see, how will this beeng age and mellow in next 20 years – it has potency to improve. Today at evening I decided to taste something older. 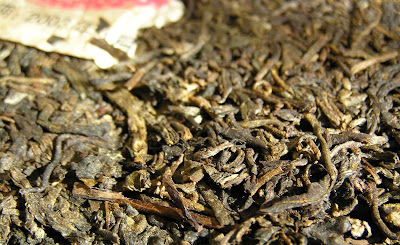 Unfortunately, I learned about pu-erh in late 2006, just before the big pu-erh market madness. So I missed the opportunity to buy some good aged pu-erh. 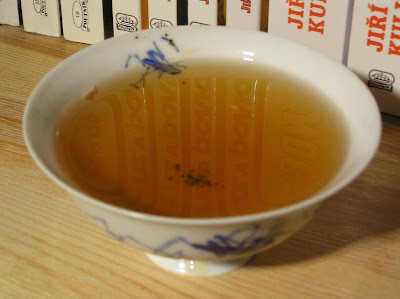 All I have are few pieces – and today I decided to drink the 1993 Phoenix from Da Li Nan-Jian Tea Factory. The tuo-cha is compressed just ok, not tight like the Xiaguan products, but still much tighter than average beeng. 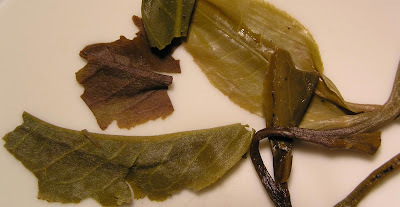 I had some problems break it, so I used one bigger piece and few smaller leaves – those leaves should add flavor to first few infusions, until the bigger piece will fall into separate leaves. First, that catches my eyesight is the absolute clearness of the brew pointing to good kill-green process. The color is beautiful dark ruby. I prefer lighter teas, but the smell is still pretty heavy, clearly aged. 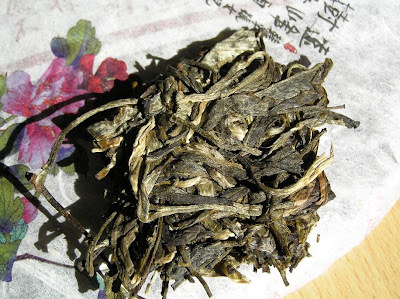 The tea is 15 years old now, so it passed its juvenility and is becoming young adult. The taste is aged yet energizing. There are hints of wood and a subtle touch of camphor in the taste. Huigan is strong and long lasting. 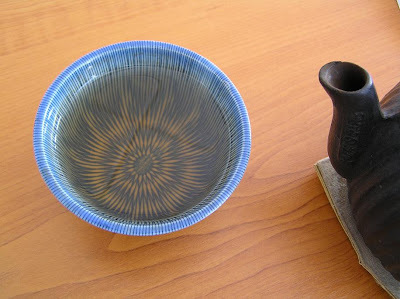 In this small tuo we can see the big difference between aged raw and shu pu-erh. There are nearly no flaws in this tea. At least I cannot find any. This small aged tuo, originally from Hou De is one of my all time favorites. 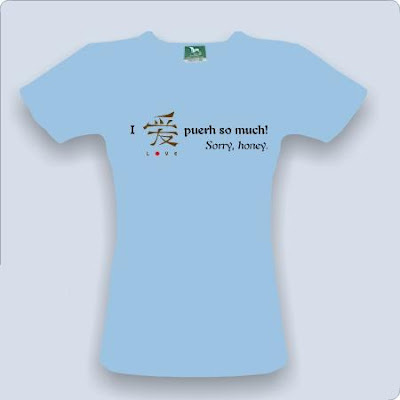 Unfortunately, it’s sold out, as all good aged pu-erh is today. But if you accidentally find it somewhere, buy it! 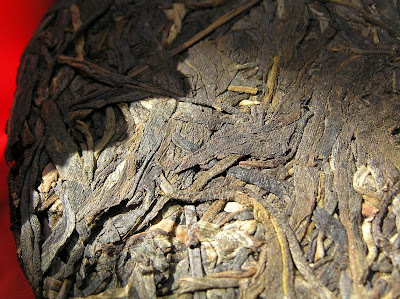 The 2005 Pu-Erh Trade Memorial Beeng is one of the tightest beengs I own. Originally purchased at Hou De, it's one of the beengs that is still available, although only in limited quantity. As you can see on a photo above, the beeng is hydraulic pressed, making the leaves very hard to separate from each other. It is certainly a tea that will not age well in dry environments. On the other hand, the beeng smells very good. A pleasant woody aroma surrounds the cake. 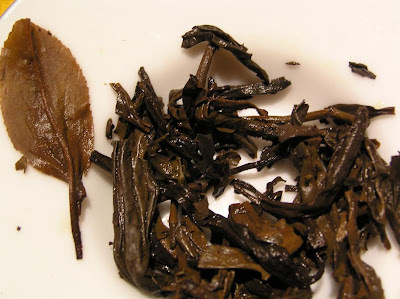 As Guang states, the producer agreed to make the tea from single-estate MengHai big leef mao cha. Hard part is to extort a piece to brew, small enough to fit in teapot and still without leaves damaged too much. Also you can notice on bigger picture how nice hairy the leaves are. The liquor is nice yellow-orange, very clear, aromatic. I found in this beeng trails of some nice Yi Wu cakes, like 2004 Yan Ching Hao. 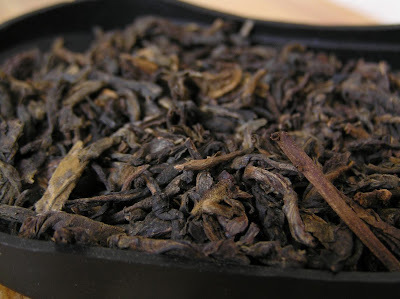 No smokiness at all – that’s surprising for such young pu-erh. It taste very clear, very gentle with hint of leather, sweet honey and small fruits. The durability of that cake was good, surviving more than 10 infusions with loosing too much taste and strength. As you can see from leaves, there are tons of stems. These stems looks OK, they are flexible and definitely not too woody. The leaves are broken, but as I said on the beginning, it's really hard to get decent leaves from cake solid like this one. 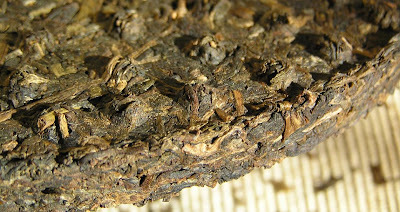 The 2005 Pu-erh Trade Cake beeing $30 per piece is very nice drink-me-now tea. I do not think it's ageable here, but it's ready to be enjoyed right now. Also, check out Hobbes review.